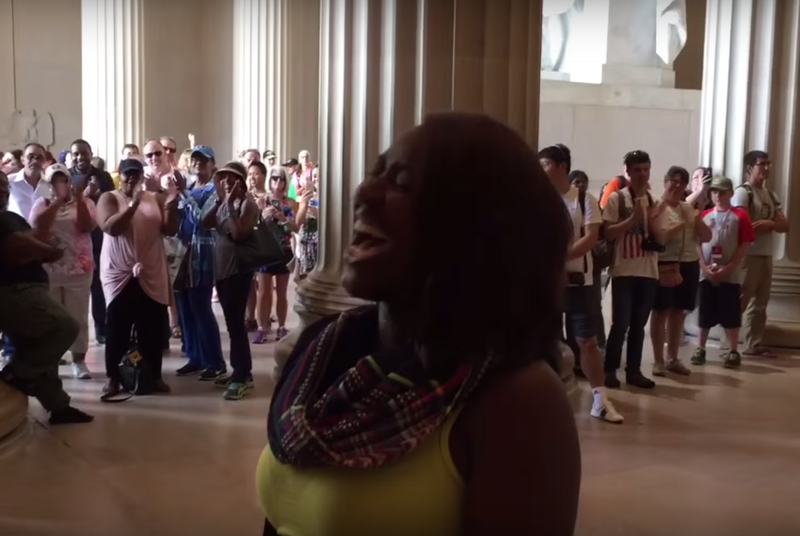 Throughout her very moving, impromptu and now very viral rendition of The Star-Spangled Banner inside the Lincoln Memorial, Star Swain (like many singers) kept her eyelids closed. But just why do people close their eyes when they sing? Most people don't realize that 90% of our sensory input is visual in nature. The remaining 10% has to be shared by the senses of hearing, smell, taste and touch. It's also fascinating that 40% of the mass of the human brain is dedicated to vision. One benefit of closing our eyes is that there's a temporary mild reduction of blood, nutrients and neurological activity in the brain's visual center - and an up-regulation of these qualities in the remaining 60% of the brain. Thus the other four senses, along with the emotional and cognitive portions of the brain gain some temporary sensitivity. Provided there is a relatively high level of affection, the vast majority of the time we close our eyes while we hug another person (or animal). This is because during eye closure - we quickly increase our ability to feel affection even more deeply. We love that person, and when we hug them we want to feel it more. A similar phenomenon occurs when we taste a delicious dessert or smell a favorite flower, etc. It is not just our imagination that the chocolate tastes better - it really does taste better when our eyes are closed. Even a person with excellent vision will instantaneously increase their sense of touch a - by just closing their eyes. Singing a song well is not only a very multi-sensory experience - it's a deeply emotional experience. Closing one's eyes while singing leads to increased auditory acuity and improved vocal control - which when acting together is a type of biofeedback. While singing this also enhances concentration and bringing some performance to a level of self-hypnosis as well as method acting. This allows the singer to express a great amount of energy in the moment as it becomes a larger-than-life experience. This entire behavioral cluster acts as a contagion and pulls us into Star Swain's emotions. Labels: Body Language, Body Language Expert, Eyes Closed, Lincoln Memorial, National Anthem, Nonverbal Communication, Star Spangled Banner, Star Swain, Video, Why do people close their eyes when they sing?